"Piti piti zwazo fe niche li." Little by little, a bird builds its nest. The Pazapa model is based upon the guiding principles of solidarity, mutual respect, equity and inclusion. Pazapa — "step by step" in Creole — has empowered over 2,000 of Haiti’s most marginalized families since 1987 through comprehensive programs providing specialized medical care, inclusive education, outreach, advocacy, economic opportunity, and access to the arts. Sebastian, 7, takes his first steps with the help of the PAZAPA Physiotherapy Program and Juliette, 4, a student in the PAZAPA School for the Deaf. Lynn Arwen Salomon, 6, demands "an inclusive school, accessible buildings, adapted school materials, and well trained teachers" at the December 3rd commemoration of the International Day of Persons with Disabilities. 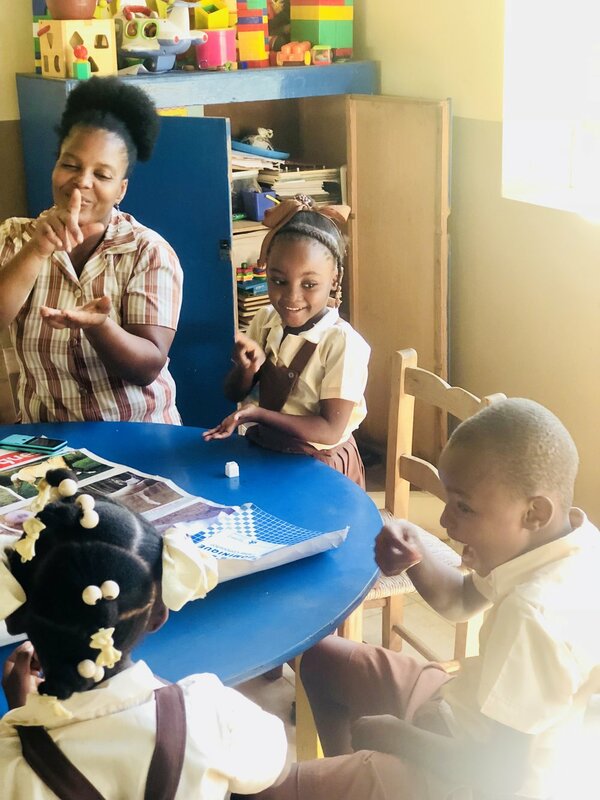 Cherismène Fleurantin, a teacher in the PAZAPA School for the Deaf, ensures that students learn in an adaptive environment that also supports creative expression and builds confidence. Fabenson, a 20 year-old with quadriplegia, was discovered in a rural village by our Outreach Coordinator. Now five years later, he's studying to become a disability rights lawyer thanks to a PAZAPA scholarship. 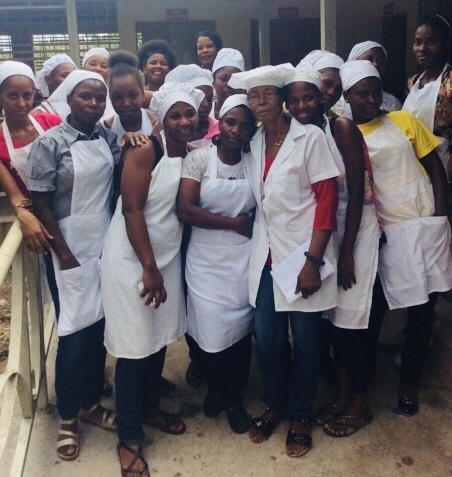 Madame Lubin, our Family Support Program Coordinator, poses with her culinary students who plan to make and market PAZAPA Brand goods on graduating in June 2018. Ansey, 15, is an enthusiastic student in Pazapa's B2 class, which focuses on adaptive learning, support and socialization for children with severe cognitive disabilities. Ansey is gaining confidence and learning to express herself creatively through art therapy facilitated by Fulbright scholar, Gloria Simoneaux. Clinical evaluations, surgeries, medication management and rehabilitative therapy provided to children with medically treatable disabilities such as clubfoot and epilepsy. Specialized early intervention, preschool and primary instruction for children who would otherwise not have access to an education. Students are provided quality instruction to the national certification level while building language, social and coping skills. Community-based workers support the social, educational, medical and economic welfare of over 100 homebound children in 5 rural villages through home visits, medical clinics, school mainstreaming, microloans, community meetings and parent groups. Awareness events, radio broadcasts, symposia, mainstreaming assistance, community meetings and inclusive education trainings change norms and combat harmful misconceptions about disability, build community cohesion and promote equal rights. Vocational training and scholarships to build skills and livelihoods in art, construction, cooking, law and sewing. Ti Commerce microloans for mothers to start businesses, and post-hurricane disbursements of food, crops and livestock to help families rebuild. Training in creative vocations for Haitian teens with disabilities. Art therapy and performing arts opportunities for all the children and families served by PAZAPA. 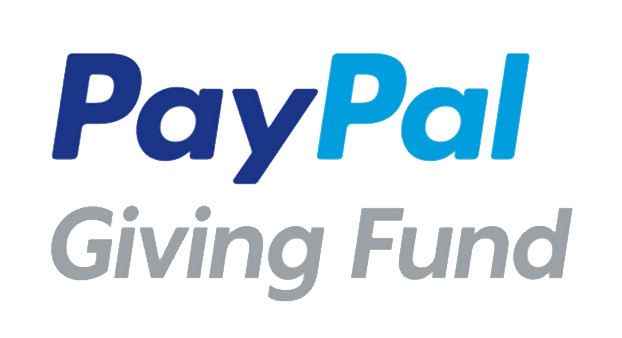 Thanks to our dedicated staff, skilled volunteers, collaborative partners and generous donors, Pazapa has made a positive impact in thousands of lives despite extraordinary hardship. Even after the 2010 earthquake, our supporters made it possible to continue providing essential services and rebuild. Natural disasters, political upheavals and economic shocks have come and gone, but thanks to you, Pazapa is able to serve more families than ever. The Pazapa team works incredibly hard to get the most out of every resource. See what a difference you can make for vulnerable families in Haiti. "They come here, they treat her respectfully, they show her things that help her learn. There were a lot of neighbors who used to treat her poorly. But since PAZAPA has been visiting us, the community has begun to accept her more." "It was an incredible honor to serve as Queen and the parade was the most beautiful day of my life. I'm grateful for all that I've achieved because of the PAZAPA School. I would not have gotten an education without PAZAPA." For a table to stand well, it must have all four legs the same length. "Yon sel dwet pa ka mange kalalou." You can't eat okra with only one finger. PAZAPA's Tony Antoine and volunteers - Dr. Kevin Latz, Dr. Fred McGlynn and Dr. Brian Deignan - join a patient and his mother after performing a free corrective tibial surgery. "Men anpil chay pa lou." Many hands make the load lighter.